With the football season soon coming to a halt, plus the fact that I liked a Sunday night game, I was determined to go and see a game on the first day of May, and there was actually a decent choice for once. Top of my list initially was Fakenham Town v Newmarket Town in the Eastern Counties League, as I'd know about that one a while back. But then I spotted one that was a bit nearer in Coalville based Bardon Hill FC. They were facing Ellistown & Ibstock, who I had seen when they lost 2-1 at Worksop Town earlier this season in the FA Vase. I learned the day before that I would be doing the trip on my own as Anwar couldn't make it due to other commitments. I was glad that it was not too far as this season had been a very expensive one as I had really gone to town on matches, and it was only self discipline that had stopped me doing a whole load more. BARDON HILL were founded in 1890. With it being a small village of only 500 people, they have done well to sustain a team at a decent level for so long. Joining the Leicestershire Senior League in 1994/95, this coincided with the move to their new ground in Bardon Close. Initially playing in Division 1, they finished runners up in 2006 behind Anstey Town to claim promotion to the Premier Division. 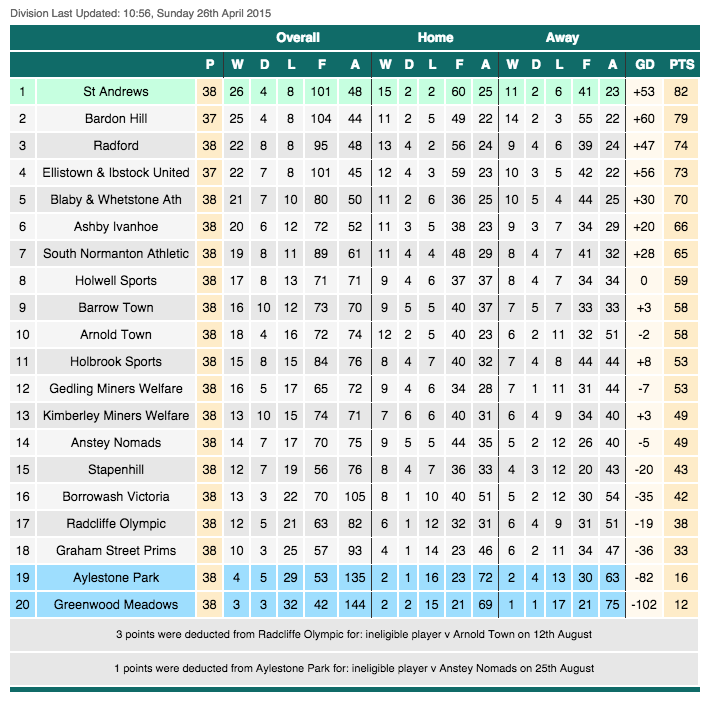 They became founder members of the East Midland Counties League in the 2008/09 season, finishing a best ever 4th place in 2009. Since then they have finished in or around mid table. But amazingly this season they could be crowned champions in the very game I was going to! They would face stiff opposition form Ellistown & Ibstock though. Being local rivals would add a bit of spice to the game and although they lost 7-1 at Halesowen Town in the FA Cup, they had beaten the now defunct Hereford United 3-2 previously, a notable result considering the Edgar Street side were a couple of leagues above them. The hosts themselves had been involved in a good FA Cup run in 2008/09. Disposing of Arnold Town in the Extra Preliminary Round, they faced their closest geographical rivals Coalville Town in the next round. In something of a surprise result, they beat the odds to triumph 1-0. They would go on to beat Barton Town Old Boys before falling to an 8-0 defeat to Northwich Victoria in the 2nd Qualifying Round. A couple of years later they got to the FA Vase 2nd Round where they fell to a 5-1 defeat to Tipton Town. They are based in the small village of Bardon and the team name comes from the local hill which was also a former volcano. On the day of the game, it was horribly busy at work, and I didn’t get out until nearly 2PM. I could have been stuck behind for longer, but I decided that once my work was done, I was out of there. I didn’t even have a break I was in that much of a rush and I only had an hour at home to have a bath and get ready for the game. 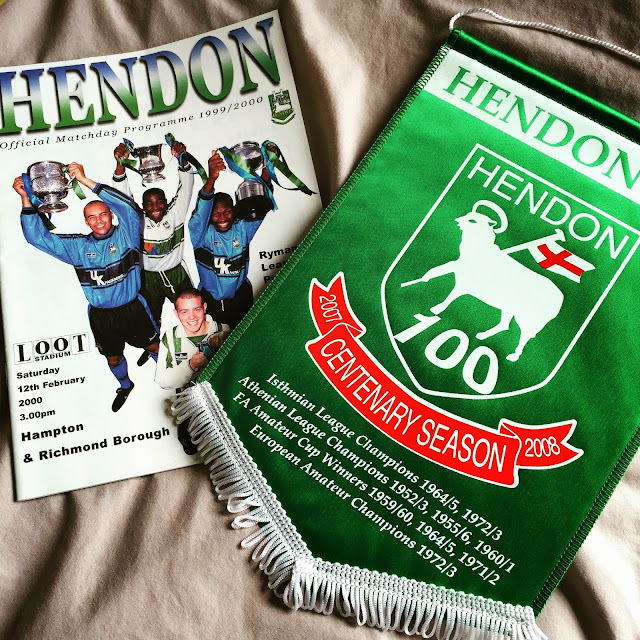 One thing I was pleased to see was a Hendon FC pennant and a programme from the game I went to at Claremont Road in 2000. I had been after this for ages, and the club were very helpful with them only charging me for the items and postage, with the pennant being a bargain at £1. 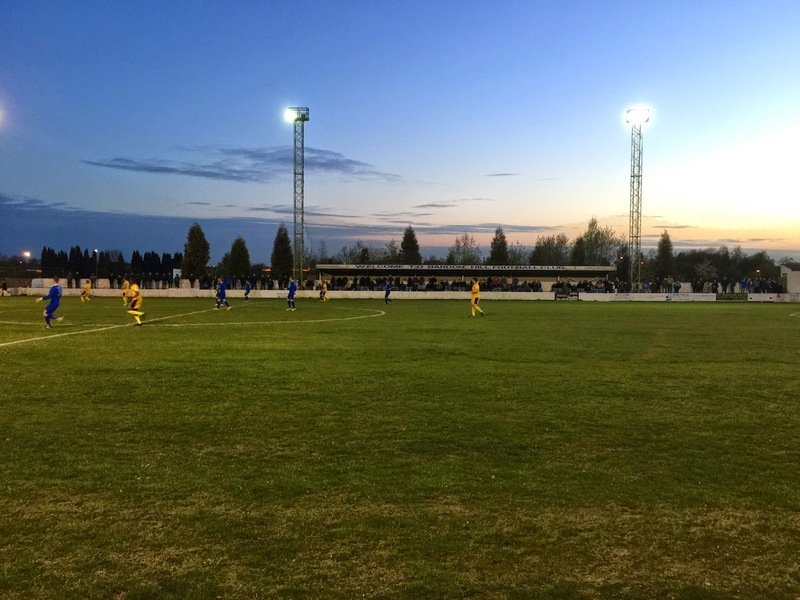 They were supposed to be involved in the playoffs on Thursday but due to the Isthmian League and FA’s dawdling, the game was delayed. 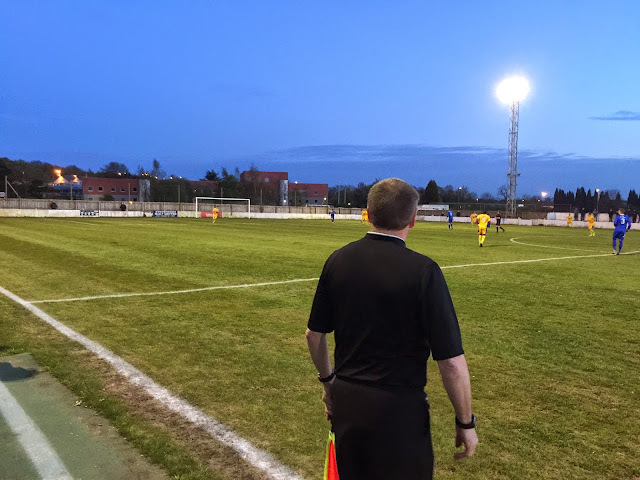 It was due to Enfield Town fielding an ineligible player - but the thing is, they were only told that they couldn’t use him a while after the game due to paperwork going astray. They reported themselves immediately and now face a 3 point deduction for something that was not their fault. For Hendon it means uncertainty over when they will play the game, or indeed the opponents - as things stand Metropolitan Police FC will step in if Enfield’s appeal fails. I wanted to leave at 3.30 and in the end left a few minutes later than I wanted to. I stopped at B&M bargains in Aylesbury to get some stuff for the weekend and this had the added bonus of cutting around 15 miles off the journey. As you would expect, it was busy in the roads and the M1 was it's usual pathetic self, often coming to a standstill, especially through the 20 miles of roadworks. I got into Coalville after 30 minutes delay at 6.30. 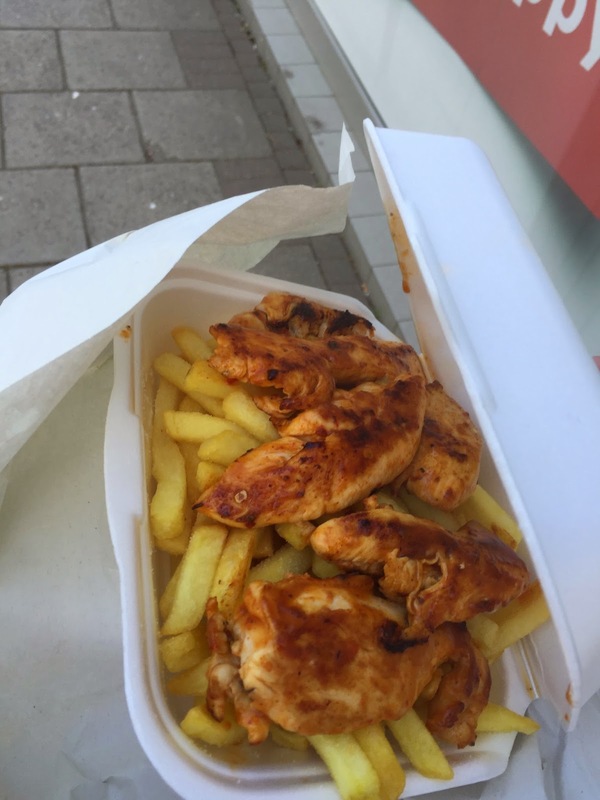 For dinner I went to Fusion BBQ & Pizza house where I had Piri Piri chicken. It was served pretty quick and I ate it before leaving for the ground. Very nice it was too, had I arrived earlier I might have gone to Wetherspoons for a sit down meal, as they are very good value. I was there and in by 6.55 but unbelievably they had already sold out of programmes, annoying many people and costing themselves a fair bit of money in the process. I went into the bar and got myself a pint of Strongbow while I waited for the game to start, with the crowd getting ever bigger for a pivotal match. I met AFC Bournemouth fan 'Cherry Hopper' off of the Kempster forum and while chatting to him I found out that he'd had the last programme a couple of minutes before I'd got there. I was hoping to get an electronic copy or a reprint. Either way I was not going to do what a certain hopper did after going to Maltby Main in Yorkshire. He had travelled nearly 200 miles, but upon hearing that programmes had sold out, he sulked in the car for 2 hours without going in while his mate watched the game. I also bumped into a few familiar faces as kick off approached including Chris and Jack who I had met several times before, with it being a big match and a Friday night, there were plenty of hoppers in attendance. A brief summary of the game from my point of view - I have included the match report from the official Bardon Hill website below for a better and more concise opinion. 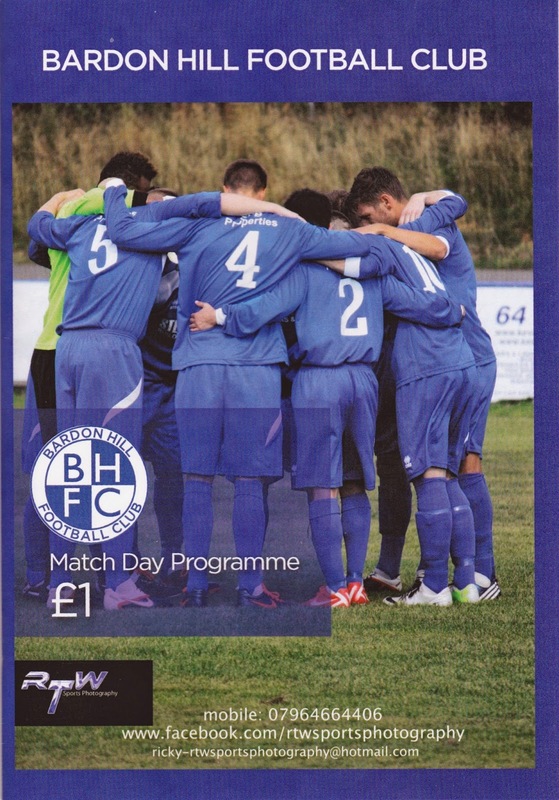 Bardon Hill controlled the game from start to finish, scoring some cracking goals. Ellistown & Ibstock scored a penalty early on to much cheers from programmeless groundhoppers. But this was the home sides night. The pick of the goals for me was the 4th, a dipping volley into the top right hand corner by Carl Slater. The game was over at half time with it being 5-1. There was one more goal and a bit of handbags in the second half as tempers spilled after a meaty tackle from the visitors. The ref handled it well though and overall had a good game which was nice to see. After the game I stayed around and watched the cup being presented. 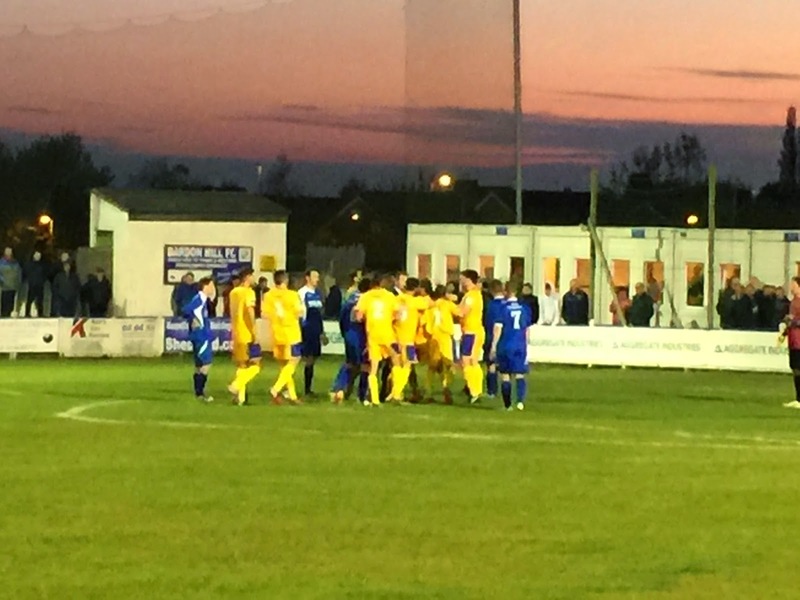 There was an impromptu fireworks display amongst jubilant scenes amongst the players and club officials. They had pulled off a real feat by winning the league and on the evidence of what I had seen before me, it was richly deserved.It was a shame that they had not produced enough programmes as it put me in a bit of a negative mood and meant that I didn't enjoy the game as much as I should have. I did get a couple of back issues from a kind club official though and that was better than nothing. In fact everyone at the club was really nice and I was pleased for their success. I had a decent drive home, getting back at 11.45 and chilling for a couple of hours before bed. 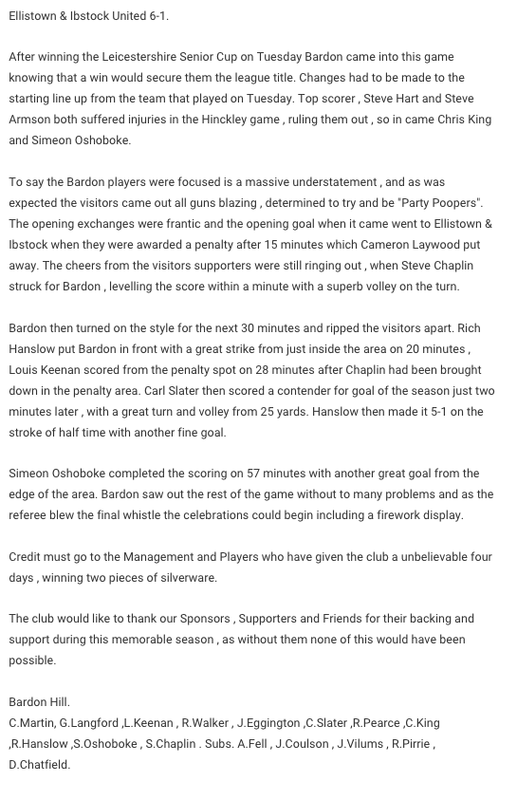 BARDON HILL CLOSE is a great little ground for step 6 and could probably serve the club up to step 4 level. There is a covered seated stand for around 200 and along that side uncovered terracing as well. The rest of the ground is flat standing. The bar is smart and does a well kept pint of Strongbow amongst other things. The tea bar also had a wide selection, though I didn't partake as I had already eaten. Overall a nice day out at a club run by good people.